A VIEW FROM EVERY ROOM! 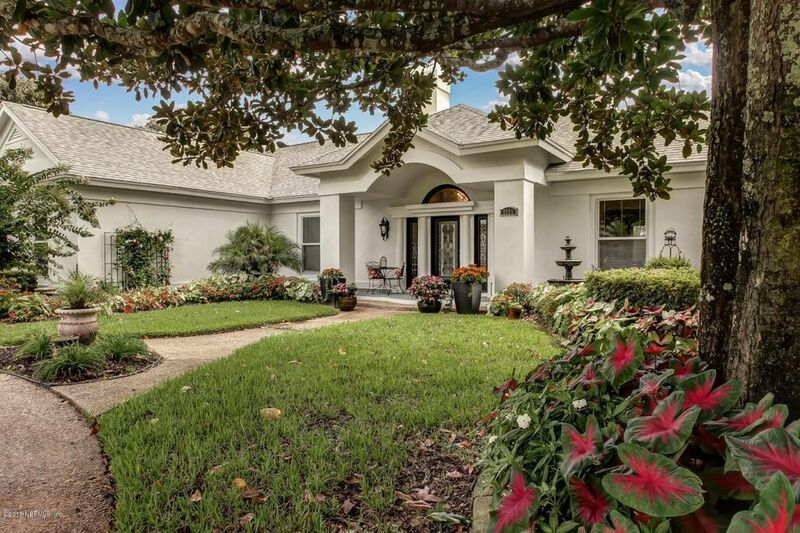 Sprawling home in Cimarrone among lush landscaping faces 6th green & backs up to 7th tee box. Championship golf course set among pine forests, beautiful lakes & scenic marshland of NE Florida. Elegant home is nestled in a Country Club Community on over a half acre lot. Enter the gorgeous leaded glass doors to the wide plank acacia hardwood flooring, rich finishes & architectural details. Kitchen with exotic granite, stone backsplash, custom cabinets, limestone range hood, coffered ceiling & Electrolux appliances is a dream come true. Spacious Owner's Suite with sitting area & custom closet offers a spa like Master Bath with claw foot soaking tub, walk in shower & furniture style vanity. Summer Kitchen is nestled under one of two pavilions on the oversized patio. Directions: I-95 West on CR 210, 2.7 miles turn right into Cimarrone. Left on Seneca, Left on Sequoyah. Home is on the right.